What? A first party overcharging for digital, vendor-locked long-term rental? I am shocked. Shocked, I tell you! Is this like the PSN+ style membership where you get to RENT them for the month or do you own them? I understand that the eShop sells them for ~$8-10 but still.. its 400 for a poster set and 500 for a messenger bag.. I got the star messenger bag and it is pretty tiny. Like would be a regular messenger bag to a 14 year old girl. Other than that had some fun with the huge ar games poster and I just bought Mario 3d and pokemon rumble blast so hopefully that should net me something good. Also, if you buy products spend the coins on whatever you want none of the crap they have is omgwtfbbq great. The free zelda cd that came with buying OoT 3d was probably my favorite thing I have gotten from them and it was free. I don't see how the games are considered overpriced when, in the end, Nintendo is handing them out for free. That means you'd have to buy three Wii games in order to get a game that would normally cost $8 on Nintendo's eShop. The real challenge here is to find three Wii games worth buying. 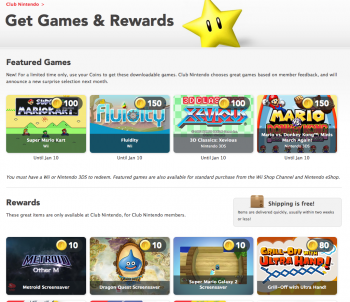 Your Club Nintendo coins are normally good for items like patches, greeting cards, and posters. Hang on, patches? Do you mean extra DLC? Because you surely aren't suggesting that people redeem these things that they paid good money to earn on a patch to produce a more stable and bug-free game. I'm usually a stickler for using proper terminology, but this time I genuinely just want to be sure I haven't misunderstood you, because the alternative is too mind-bogglingly idiotic to comprehend. Ha that would be great, but no he is talking about mario patches and the like to put on clothes and stickers and wall decals. That kind of stuff. Also if you spend a ridiculous amount of money in a year you get upgraded to gold status and I got a little calander for it. I was only a few hundred points away from the elite gift of mario pins too 8P. I have a lot of coins because I end up buying a lot of 3ds virtual console, 3DSWare, and DSiWare games. Being able to buy games with coins is helpful. I look forward to seeing what games they are going to give out for free. If I don't end up buying them beforehand. If I want VC games, I might as well buy them. For one, I get 10 coins for having a linked shop account and completing the surveys from buying the game. Two, I'd rather have the neat swag that I have no chance of buying at all. The Zelda posters I got are HUGE, like, the size of posters you see hanging up at the local cinema. I also got the Mario tote bag which is really handy for carrying my school and library books, though it's not really big enough for groceries. And recently, I got the t-shirt, which is pretty big even for a small. And all of the prizes arrive at my house within a week, with free shipping. tl;dr don't buy digital content with coins, buy the real life swag instead. Eh, collectibles are collectibles. If you don't care for them, then you're not really in it for the fan swag anyway. A lot of whining and moaning about a service that doesn't have to be offered and that no other first party offers. Why bother Ninetendo, when your fans are so ungrateful and self-entitled? I dug through and old stack of GBA-DS game boxes because I used to be a terrible hoarder and ended up with enough points to qualify for the elite status. Nintendo send me a box of cute Mario themed pins. I for one will enjoy these free classic titles that I get just for being a customer. Haters gonna hate. I got the star messenger bag and it is pretty tiny. Like would be a regular messenger bag to a 14 year old girl. I ordered it thinking it would be a somewhat cramped makeshift laptop bag. Boy was I wrong! *This list currently ignores all anime related, Guitar & Rockband related materials, as well as games I just kind of go "huh" at, most fighters and fps'. Also every sport game because I think it's stupid to buy a game that's going to be worth $1 in a year or two. *This list also ignores anything I kind of view as a "Bejeweled Clone" since there are so many free versions. *This list also ignores anything that looks, seems or remotely screams "Move cash-in". *I stopped looking once I was only getting repeats of games already on the list. *Not all games on this list are considered great for everyone, some are considered childish, "stupid" or otherwise, it is your decision to research them before buying them, rather than just going "OH he made a list, he must know what he's talking about!" *I am ignoring fanboyism hatred, the games selected on this list ranked at least 60% on their reviews through Amazon, minus the games that are listed twice with 5 stars on one, and one star on the other x.x.. I'll add more links to trailers when I have time, preferabally when I don't have work in the morning. I welcome everyone to put their own opinions of these games, to buy or not, etc, why, what they thought of them, as well as add anything to the list. I know, I'm getting a lot of shifty eyes right now. *This list, is just a list of "POTENTIAL GOOD BUYS FOR THE WII", do not ignore the first word. So this list comes out to about 1/20th of the library :/.